ducks are worth more than 1c. PERMANENT SYS costs 5c per, lasts until the last minute and 30 seconds of each game! This is a way of music.. expression.. life.. Fans of the games and rooms brought to you and sponsored by The Endaunce Parks and Recreation™ Staff. This is for the habbos who thought, at the time, their habbo name was genius, but later realised how much they hated it and now have to live with the regret. Join fellow habbos and cry your woes together. If you cant handle my worst..
you aint gettin my best, must be how Marilyn Monroe felt.. Wired Maze Of Doom Prize - 100c. 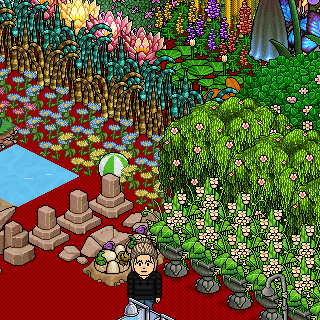 Currently the hardest Maze on Habbo. Have you got what it takes? Search TryingSquare for entrance. Shut the door on the way out. With ultra fast pass, you are able to skip to the 6th room of the wired maze with only 3 left to complete! Goodluck! Good luck and enjoy Only Pay Unlocking / N-J-8 for any passes you bobba to buy. Mm those Swans tasted delicious! FC THE GRAND NATIONALS!!!!!!!!!!!! This is a rehabilitation service for horses affected by the disgusting sport horse racing. Viking raiders! Pull up the anchor and set sail; there are villages to burn. Habbo Fashion Show must go on! Invite friends or keep it exclusive! Hit the slopes in style! Piled high with christmas lights, candy machines tools… what more could an elf POSSIBLY ask for? NEW EXCLUSIVE PENGUIN Topiary included! Stock up on sweet and salty seasonal goodness at this Bavarian Christmas marketplace! Comes with a NEW exclusive Seal Topiary. Pick up this bundle and get yourself a positively SUMPTUOUS dose of psychedelia! Brighten up your day with this Back to School bundle! Find some peace and relaxation in the depth of this dungeon! This candlelit room is the perfect place to store your treasure within the protection of wide Gothic Walls and the comfort of Dungeon and Lodge Furni! *Ding Dong* The church bells are ringin' and L-O-V-E is in the air! Roast some marshmallows, drink hot chocolate and warm your pixel toes by the fire. From blankets to BBQs and all the movie extras in between, this pre-decorated Luna Cinema Bundle is packed to the moon (and back) with everything the ultimate outdoor movie buff could desire. Taken in this room on 13 September 2018 and received 3 likes. Taken in this room on 18 May 2018 and received 3 likes. Taken in this room on 19 February 2018 and received 1 likes. Taken in this room on 19 February 2018 and received 0 likes. Taken in this room on 13 February 2018 and received 0 likes. Taken in this room on 12 February 2018 and received 0 likes. Taken in this room on 11 February 2018 and received 0 likes. Taken in this room on 9 February 2018 and received 0 likes. Taken in this room on 8 February 2018 and received 0 likes. Taken in this room on 7 February 2018 and received 0 likes. Taken in this room on 30 June 2015 and received 0 likes.